It’s been a weird month, an otherwise routine one that has been punctuated by periodic not-so-good news. As such the work-life-play balance has been a little askew. I’ve tried to figure out where the sadness and worry fit in, and you know what? They don’t. They just permeate everything, like the persistent yellow film of tree pollen that we’ll be seeing here soon. So distraction has been important. 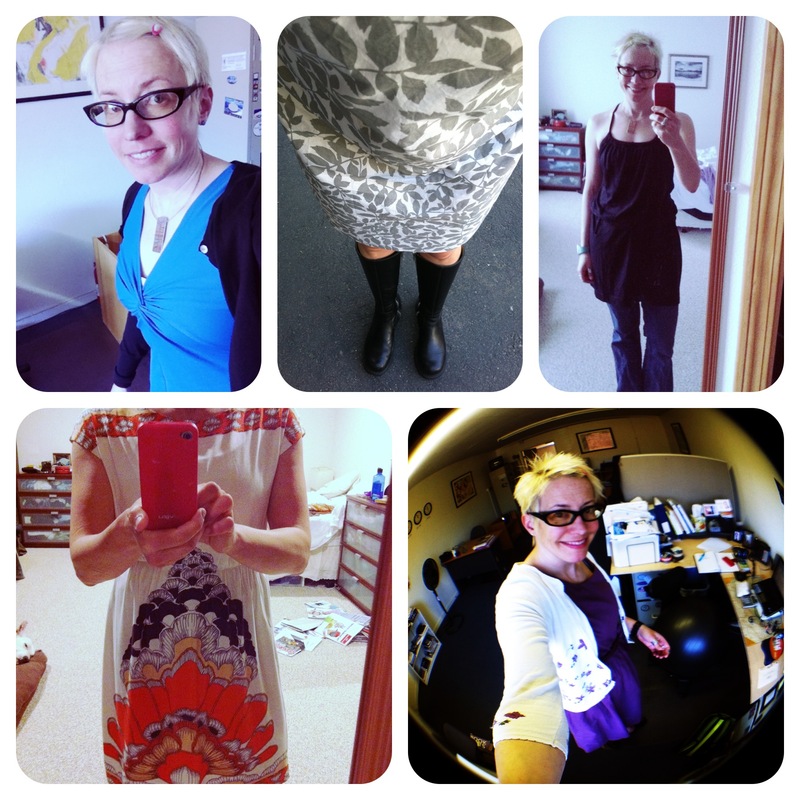 My friend’s project, 33 dresses, has helped. At the very least it’s encouraged me to pull out and iron some much neglected dresses. And apparently there are a few friends who don’t believe I have that many dresses, so they’re no doubt checking my photos with an eagle eye to confirm there is no duplication. Other distractions right now include the ants that have decided to stake their claim in the kitchen, the local adventure race I signed up for – despite not being a big fan of jumping through fire, and my new found obsession with snack mix with nori. And as we close out the month with (what I hope is a quiet) holiday weekend, I’m hoping that June is a decidedly drama-free month. I know that I’m not the only one who could use that. I have this friend, Elissa. I’ve known her since elementary school. She’s always been ambitious and chock-full of ideas – the type of person who can brainstorm a friend’s career path over lunch and then come up with a new business plan by dinner. She’s both inspiring and optimistic. Despite our clearly opposite personalities, we’ve remained friends all this time. She was diagnosed with breast cancer earlier this year. Faced with 33 days of radiation, she started a project. She’s calling it 33 dresses. As her site (and the above video, created by another good friend) states, 33 dresses is “a celebration of living our lives no matter what”. Whether it’s digging out the dresses you’re saving for a special occasion, calling that old friend you’ve not seen in months, or trying that yoga class you’ve been too busy (or intimidated) to try, 33 dresses is all about celebrating life. However you define it. Starting next week, I’ll be joining Elissa in her 33 days of radiation, and inviting anyone interested to come along for the ride. I’m using this as an opportunity to break out the special opal earrings N gave me years ago that I rarely wear because I worry about losing them. Along with one of the fabulous vintage dresses I’ve collected over the years but rarely wear (it’s Tahoe, after all). While drinking that latte. Typically our random acts of fun (RAF) veer more towards outdoor play – skiing, mountain biking, etc. But we do appreciate the less demanding forms of fun (see: wine walks, Lake Tahoe Shakespeare). 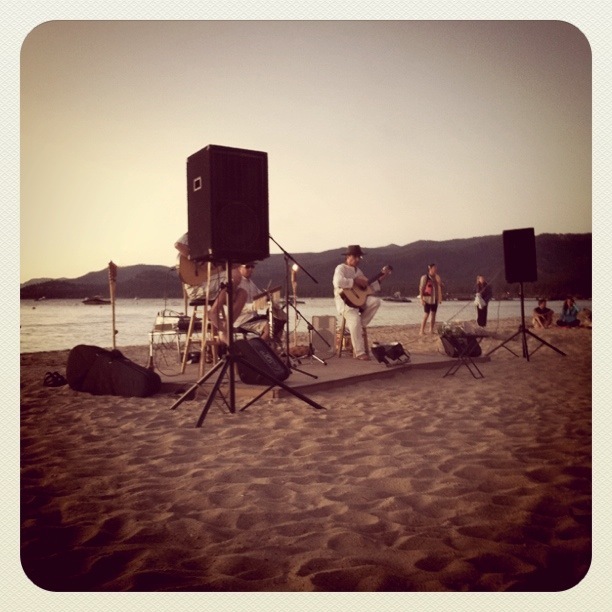 Music on the Beach is one such example that we look forward to each year. 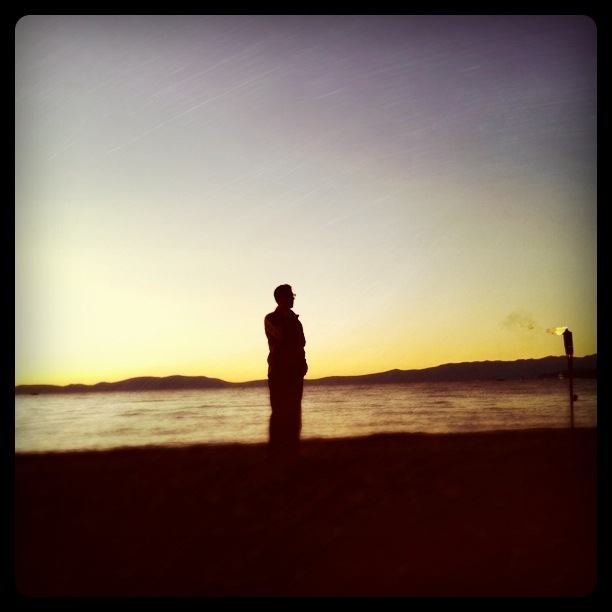 For the past three summers, the folks at Tahoe Lakeshore Lodge have hosted musicians for free sunset concerts on its beach. If, like us, you don’t live on the lake, and tend to engage in activities that are in the mountains versus on the water, these evenings are a way to appreciate that large body of water. It’s open to visitors and locals alike, though it tends to be the latter that we see there (which means I see more than a few familiar faces). The performances vary, but we look forward to seeing Martin & Vargas perform. Nuevo flamenco goes very well with sand, lapping water and the setting sun. Last night was our first concert, and we invited a few friends who’d never experienced it before, and they clearly appreciated it (and the pan of coconut dream bars that I brought) as they stayed even after I had to drag my tired self home. But I did manage to stay for the sunset, which I see as the centerpiece (finale?) of the evening. I’ve had a bit of a fickle relationship with blogging over the years, trying out a few hosting sites, names and blog titles until I came to my senses and committed to WordPress earlier this year. Not long ago I came across some posts from my very first attempt at blogging, and imported them here, creating a bit of confusion for my one subscriber. These posts date back five years, which is a bit of a surprise. I knew I’d been kvetching online for some time, but 5 years? Sadly the first thing that came to mind was Barbra Streisand’s song (bad quality vid of it above) of the same name, which either speaks volumes for my long-term memory, or illustrates that I’m more of a Babs fan than I realize. Happy anniversary to me. Five candles is definitely doable, moreso than the candles that will be on the upcoming birthday cake! Soleil got tired of wearing the same queen costume she’s worn for the past few years, and this year decided to go as a jogger instead. For most of her life, Soleil has been my favorite hiking buddy. She was there before I met Nils, and was there long before I realized that mountain biking was actually more exhilarating than hiking. She’s accompanied me along numerous Lake Tahoe hiking and running trails, and knows the Desolation Wilderness better than most people. 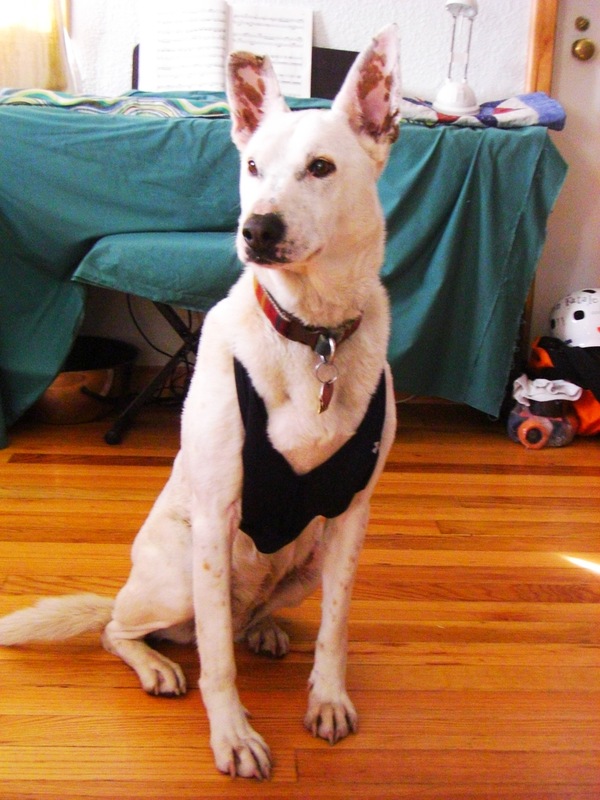 Most of this summer has been spent in the bike saddle – or on my roller skates – so the dog’s not had the same volume of hikes as years past. I’ve only begun to make it up to her as the leaves change, which isn’t a bad thing, given that autumn is one of the nicest hiking seasons here. The past few weekends have brought us quiet trails, colorful leaves, and some terrific views. As for the mutt, even at 10, or 70, depending on whether you count dog years, she’s still able to climb the 3,000 feet to summit Tallac, and still garner the adoration of dog-loving passersby. And when there’s someone watching, she’ll still prance with a large stick like the overgrown puppy I like to think she still is. I know she’s getting older, but I’d like to think we’ll have another few seasons of hikes ahead of us. After all, there are lots more large sticks out there. And loads more prancing to do. I’ve been told that for its many rewards, parenthood can be challenging. My brother and his friends have developed an interesting game to counter some of those stresses. Called ‘Lions and Wildebeests’, the game pits the dads (aka the Lions) against the kids (Wildebeests). Essentially a mix of kickball and dodge ball, the game, which one could call sanctioned violence, requires the fathers to kick a large, admittedly light, rubber ball at their kids. If it hits one of the children, that child is out and must sit down. Unless they’re clocked in the head/face. That counts as a free hit, and the kids can continue playing. Can you sense the incentive here? I witnessed a few games recently, with about a half a dozen dads versus twice the number of children. It was hilarious. Imagine chaos on the field, with the smaller kids giggling and running around in circles, and the older kids trying to be strategic by taking the ball to the face, so they could stay in the game, while the dads yell supportive things like ‘Nice defense’ and ‘Good hit’, trying to hide any fatigue they might experience running after a posse of children. The dads don’t have it too easy though. As I was told, the lightweight rubber ball isn’t as easy to steer with a kick. How else to explain how they missed so many clear targets? That, and their visible fatigue makes me think that they might benefit from some more practice and training.